A fairly new North Fork tradition is the Winter Ball in February. For the third year in a row, the culmination of weekly winter dance lessons is the glamorous Winter Ball at the Hall. For all of its glitz and glitter, the Winter Ball is funky and in keeping with North Fork lifestyles. Ladies comb through ball gowns in local thrift stores searching for just the right outfit and everyone brings refreshments to share. 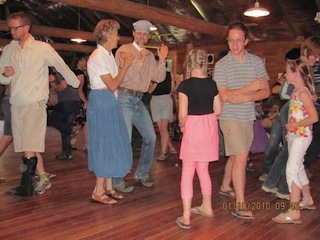 Debo provides the music which is mostly along the lines of two step, waltz, and swing dance music……sometimes there is line dancing too. The entire community is invited to this event which starts at 7:00. Even if you don’t want to dance, it is a great opportunity to visit with neighbors and see what North Forkers have been learning in the winter dance classes.